For the past few weeks, I've been on the lookout for falling anvils, choking hazards, and any cheetahs that may have escaped from the local zoo. Why? Because I failed to eat Hoppin' John on New Year's Day. Growing up, my mother and grandmother, both natives of South Carolina, were fairly convinced that the fabric of space and time would collapse if we should ignore this ritual. There's a fine line between a cultural tradition and a symptom of Asberger's syndrome; in my family, when it comes to Hoppin' John, this line is completely blurred. Now, all you Yankees (i.e., folks from New York, California, Bangladesh, etc.) may be wondering, "Who the f**k is Hoppin' John, anyway? A hyperactive blues singer? A lesser-known character on The Simpsons? That horse they had to put down after the Kentucky Derby?" Neither an animal nor a banjo player on meth, this starchy dish is a rather bland mixture of black-eyed peas, rice, and sundry spices that Southerners of all ilk eat on the first day of the year—and pretty much only then. Growing up, on New Year's Day, we would always have Hoppin' John and "a whole mess" (i.e., a great deal) of collards. In my family, failure to observe this culinary ritual had serious ramifications. My grandmother had any number of cautionary tales about the years she neglected to eat black-eyed peas and rice on New Year’s Day. The year my grandfather died, for instance. Sure, the doctors called it “congestive heart failure,” but Grandmama knew the truth. It was the Hoppin’ John (or the lack thereof) that did him in. I’m not nearly so superstitious, but usually I try to keep up this tradition. But, as it turns out, black-eyed peas are almost impossible to find in Seattle. I get the feeling it would be easier to score black-tar heroin (whatever that is) in this town. “You mean, like, the band?” Asked the grocery store clerk, when I asked him where to find black-eyed peas. He was 19-ish, with a name tag that read “Tyler.” He seemed seriously stoned. At least, I gave him the benefit of the doubt by assuming that he was. “No, like … the thing you eat?” I said. Clearly, the idea of a food sharing the name of Fergie’s band was blowing young Tyler's mind. He just looked at me, as if I'd asked for something completely crazy, like, say, unicorn steaks—even though everyone knows unicorns are endangered and killing them is just plain wrong! “Little bean? Black... eye?” I attempted a descriptive gesture, which proved futile. Legumes are hard to pantomime. Alas, I went home sans black-eyed peas. 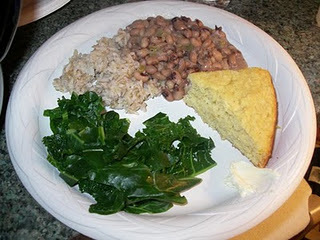 Some years back, I forced some Yankee friends to experience the Hoppin' John and collard greens tradition on New Year's Day. I insisted to my friends that this meal would be the key to all things good in the coming year. Over the next 12 months, the friends in question would lose their jobs, break up, and move back in with their respective parents. When I told my mom this story, she just shook her head. "Shouldn't have used canned."